Abbie Main, from Elgin, died on Christmas Day 2017 following a five-year battle with the illness. Before her death, the determined 15-year-old set up her own charity to help other children with “hospitals and stuff” during their own cancer battle. Now Abbie’s Sparkle Foundation has passed the 100 landmark for the amount of families it has helped – funding gifts known as “sparkles” totalling tens of thousands of pounds. Abbie Main, who died on Christmas Day 2017. 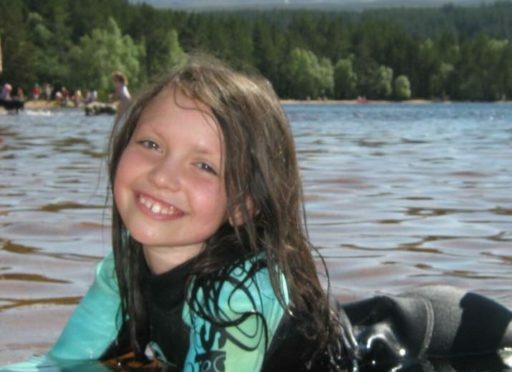 Yesterday, the teen’s family announced the huge outpouring of support from communities in Moray and further afield had also allowed them to bring forward plans to open a holiday home in their daughter’s honour. Initially, parents Russell and Tammy Main had hoped to open the Sparkle Lodge in Aviemore within three to five years of the foundation being established. However, the constant flow of donations means the family now hope the doors will be open on the home during the summer. Mr Main said: “Aviemore was probably Abbie’s favourite places to visit, with the wildlife park, Loch Morlich and everything else that goes with it. “When we’ve asked for words to describe Abbie ‘beautiful and glamorous’ were two that kept coming up – so that’s what we want the lodge to be too. It is hoped that up to 25 families will be able to visit the lodge each year – meaning about 500 will benefit during its anticipated 20-year lifespan. Support already provided by the charity include financial assistance to cover insurance for overseas trips, dream holidays to attractions including Disneyland and financial support to families having to spend time away from home for hospital appointments. Abbie’s loved ones also made trips to hospitals at Christmas – the talented cheerleader’s favourite time of year – to spread gifts to youngsters spending the festive season on a ward with more trips planned for Easter. Last night, Mr Main thanked the public for the generosity shown in honour of his daughter and revealed another 44 fundraisers had already been planned through the year – including a Strictly Come Dancing event at Abbie’s former school Elgin Academy, a four-person climb of Kilimanjaro including Abbie’s aunt and uncle and a ceilidh. And the fundraising efforts have received the added boost of the foundation being named “charity of the year” by local businesses including Johnstons of Elgin, Gordon and Macphail and Bijou. He added: “Abbie created the charity, it was her idea. We’ve just lifted it and run with it, which makes it all the more unique. “The support from everyone has been incredible. We’re constantly overwhelmed by it.